There's one colour I wear on my nails more than any other and that's lilac, in fact I probably have lilac polish on my nails about 90% of the time these days. I love how it's pretty while still being kind of understated, and although pastels are usually associated with spring and summer I think it's a nice all-rounder and something I definitely wear all throughout the year. 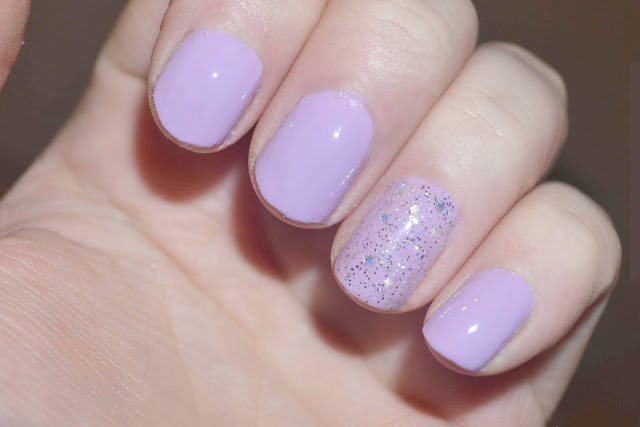 I have so many polishes that I love in the bottle, but when I put them on I hate how they look on me (my horrible pale pinkish skin tone is to blame) however I think lilac actually looks ok. For the most part, these days I try to stick with what actually works on me rather than go against my colourings. I've finally accepted the sad reality that things like coral lipsticks and blue nail polish are just never going to look good on me, no matter how hard I try! 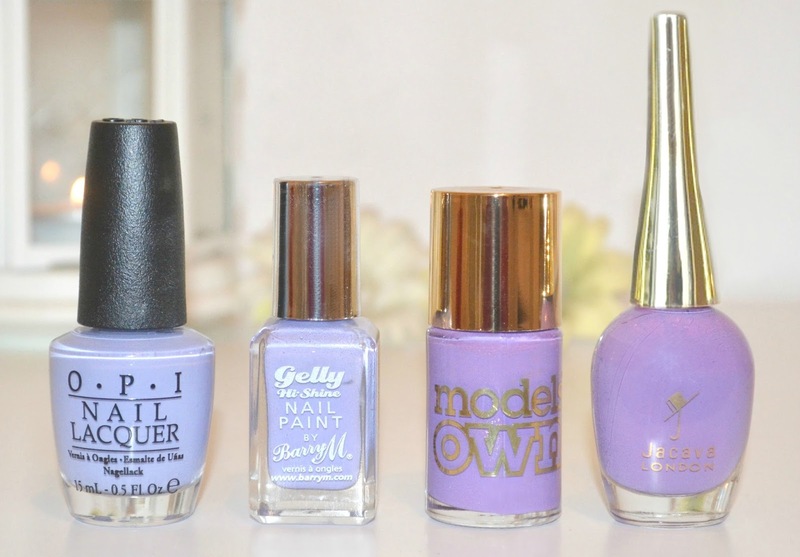 These are the lilac polishes I'm currently using. This is part of the Euro Centrale collection which explains the name, don't you just love how creatively named all of OPI's polishes are. It's a light to mid toned lilac with a creme finish and no sparkle, which is my preference for everyday wear. I love the shade of this, my only quibble with it is that it's a bit more sheer than I'd prefer and you do have to layer up two to three coats to get a nice opaque finish. On the plus side it dries quickly and the wear time is good, I usually redo my nails around every five days when I'm wearing this. You do get minor tip wear before then, but being a light colour it's not massively obvious. You can't go wrong with Barry M's nail paints; cheap and cheerful with loads of colours, and unlike some of the other polishes here can readily be picked up in Boots and Superdrug. The Gelly Hi Shine has definitely got to be one of my favourite ranges they've done, the wear time is amazing and you get the nice shiny gel nails kind of finish. A lot of shades in the range are quite opaque however this is slightly on the thinner side, needing two coats for a decent finish. The most luxurious of the bunch, this contains real crushed up diamonds which I think is pretty amazing! It's a mid toned purple, slightly darker than the previous two which I like especially for the colder months. It has a subtle shimmery finish that looks gorgeous on the nails, it's opaque in one coat although I usually do two to get plenty of the sparkles. Surprisingly this range is the same price as Model's Own standard nail polishes too. 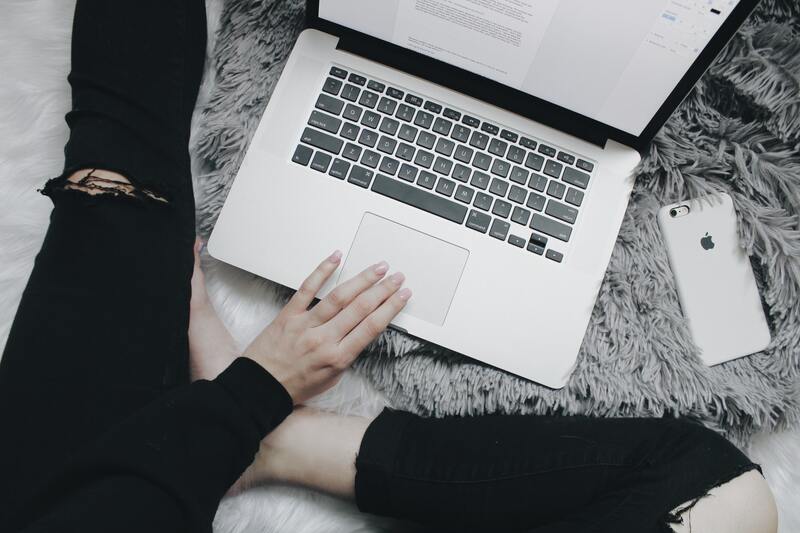 Jacava polishes are free of the eight toxins contained in most nail polishes, and so if you're sensitive to any ingredients (or just avoid nail polish as the smell gives you a headache) these are definitely worth a look. Blueberry Muffin is a mid toned lilac with a creme finish, similar to the Model's Own polish but without the shimmer. I love the packaging of these, the gold lid is really pretty and they contain a long brush that reaches right to the bottom of the bottle which is handy. The amount of polishes I've thrown away that still have a third left in them just because the brush can't reach, so luckily it wont be a problem with this one! What polishes are you loving at the moment? The Models Own lilac is so pretty! I have the same skin type as you and so light shades sometimes look odd with my skin tone but those lilacs really suit you. I usually leave lilac for spring time and more grey/lilac for winter. Lilac is one of my favourite colours and it'll probably come as no surprise I adore Prickly Pear, I'm definitely going to be painting my nails with it again now! I have the Barry M one and I love it!! You really can't go wrong with them indeed. Also I really enjoy the content of your blog generally and followed you on BL. I've got the same OPI nail vanish as you! I love that colour so much and it's not too sheer like other pastel colours. Your nails are painted so nicely, I never have the patience to sit there and wait for them to dry so there's always weird sheet prints and finger prints on them.